Westfield Football Club came out on top in an amazing 11-goal thriller at The Parish Field on Saturday. 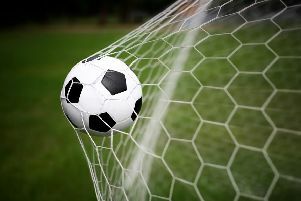 The Westies led 7-0 at one stage before eventually triumphing 7-4 at home to Rustington in their latest Macron Store Southern Combination Football League Division Two fixture. Westfield manager Jack Stapley said: “I’ve honestly never known a game like that. It could’ve been 7-7 or 15-7. “The first 60 minutes was probably the best we’ve played under myself. I thought everyone busted a gut for each other and we worked hard as a team. Westfield were 5-0 up by half time. Emmanuel Okunja opened the scoring by knocking home Roberto Martellini’s cross at the far post and Matt Dadswell slotted the second. I’ve honestly never known a game like that. It could’ve been 7-7 or 15-7. Connor Easton calmly tucked away the third following a great throughball by Okunja, the Hastings Kickboxing Academy man of the match. Ashley Paine headed number four from a corner and an own goal left Westfield cruising at the break. Westfield didn’t stop there because they added two more in the space of 10 minutes once the second half got under way. Martellini made it 6-0 by cutting in from the left and curling his finish into the bottom corner before Dadswell grabbed his second with a similar goal to his first. Credit to Rustington, though, because from a position where the scoreline might even have ended up in double figures, the visitors restored some pride with a four-goal rally which took some of the gloss off Westfield’s win. Rustington also had a big penalty shout turned down and a goal disallowed as Westfield suddenly struggled to get out of their own half on a pitch which had turned into a quagmire having started the day in good condition. Westfield: Cullip, Miller (Archer), Durrant, Paine, Willis, Hurst, Okunja (Stapley), McGurk, Easton (Banvolgyi), Dadswell, Martellini. Westfield are up to eighth in the table and their next two games are against bottom-of-the-table Hurstpierpoint, starting with the away fixture this coming Saturday. Martellini and Dadswell are suspended, David Miller is away and Okunja is working, but ex-Hastings United manager Nigel Kane is in line to make his first competitive appearance for the club having played in a recent friendly.